Stoute Next Generation bandleader Candice Chang-Sandy, third from left, poses with some of her masqueraders on Carnival Tuesday. Stoute Next Gen­er­a­tion Band­leader Can­dice Chang-Sandy has tak­en is­sue with the re­duc­tion of grants and prizes of­fered to To­ba­go band­lead­ers in this year’s Car­ni­val com­pe­ti­tions. Gwyneth Armstrong’s niece, Merna Edwards, collects the Tobago Medal of Honour of Gold for Distinguished and Outsanding Service to Tobago in the sphere of music from Chief Secretary Kelvin Charles. Head of the new­ly-formed To­ba­go Busi­ness Cham­ber Mar­tin George has con­demned the con­tin­ued chal­lenges be­ing ex­pe­ri­enced on the in­ter-is­land seabridge. Ker­win John was vot­ed in as the sec­ond Vice Pres­i­dent of the T&T Crick­et Board (TTCB) at elec­tions held re­cent­ly at the TTCB of­fice, Na­tion­al Crick­et Cen­tre in Cou­va. Pleasantville goalkeeper Akyla Walcott, right, clears the ball from the feet of Signal Hill captain Ashante Campbell (17) during the girls’ SSFL National Intercol final at the Ato Boldon Stadium, Couva, on Tuesday. Pleasantville won 3-0. Sig­nal Hill Sec­ondary’s hopes for glo­ry in this year’s Sec­ondary Schools Foot­ball League (SS­FL) Shell/First Cit­i­zens In­ter­col girls’ fi­nal were killed off by Pleas­antville Sec­ondary’s Alex­cia Ali at the Ato Boldon Sta­di­um in Cou­va on Tues­day. From left, Scarborough Secondary School Alumni media liaison Casandra Thompson-Forbes, 2018 scholarship recipient Kafala Nurse and Scarborough Secondary Annmarie Davis. A for­mer stu­dent now pur­su­ing a de­gree in Man­age­ment Stud­ies has been se­lect­ed as the Scar­bor­ough Sec­ondary School Alum­ni’s 2018 schol­ar­ship re­cip­i­ent. Tears flowed freely, some per­sons’ arms were spread wide, palms fac­ing up­wards, while oth­ers chose to jump and dance aban­don­ing all in­hi­bi­tions and bar­ing all emo­tions at the In His Pres­ence (IHP) 9 gospel con­cert last week­end. Winston Dillon holds a photo of his father Sullivan. Martin Superville, an organiser of the event, poses next to his painting titled Dat Dark Oak Rum. Above: THA Presiding Officer Denise Tsoiafatt Angus tries an elaborate shot with a coconut branch bat during a game of cricket with Bishops High School students during the school’s A Taste of our Heritage on Tuesday. The event was hosted by the school’s Department of Social Sciences as part of the ongoing Tobago Day festivities and also included other game Tobagonians play, song and dance, spoken word and speech-band. THA Pre­sid­ing Of­fi­cer Denise Tsoiafatt An­gus tries an elab­o­rate shot with a co­conut branch bat dur­ing a game of crick­et with Bish­ops High School stu­dents dur­ing the school’s ‘A Taste of our Her­itage’ on Tues­day. The event was host­ed by the school’s De­part­ment of So­cial Sci­ences as part of the on­go­ing To­ba­go Day fes­tiv­i­ties and al­so in­clud­ed oth­er game To­bag­o­ni­ans play, song and dance, spo­ken word and speech-band. LEFT: Tobago School for the Deaf and Speech Impaired representative Amecia Leacock presents President Paula-Mae Weekes with an orchid, as fellow representatives Jeremy Peters, Rachel Jemmot and their teacher Rae Samuel look on. Pres­i­dent Paula-Mae Weekes joined the list of peo­ple call­ing for equal­i­ty for per­sons with Down Syn­drome. Audience at Global Money Week Celebrations at Shaw Park Cultural Facility. Bishop’s High School principal Cindy Ramnarine chats with Signal Hill Secondary principal Xavier Tri and police officers outside her school compound on Wednesday afternoon. Po­lice have charged a man in con­nec­tion with the al­leged bug­gery of a 12-year-old school­boy in To­ba­go. A motorist navigates a flooded road in the Turtle Beach area last weekend. The To­ba­go House of As­sem­bly’s Di­vi­sion of In­fra­struc­ture, Quar­ries and the En­vi­ron­ment (DIQE) is now tak­ing a com­pres­sive ap­proach to drainage on the is­land in the flood­ing is­sues faced by res­i­dents last week­end. Parlatuvier fishermen help their colleague bail out water from his pirogue after heavy rains washed his vessel from the river bank, where it was stored for safety, into the sea last weekend. Sec­re­tary of Food Pro­duc­tion, Forestry and Fish­eries Hay­den Spencer says farm­ers and fish­er­men af­fect­ed by last week­end’s flood­ing should fol­low the re­quired process if they want to be com­pen­sat­ed for their loss. Area representative Farley Augustus looks at the state of the Parlatuvier jetty. Fish­er­men in the rur­al vil­lage of Par­latu­vi­er can look for­ward to a new jet­ty in the next fis­cal year, Sec­re­tary of In­fra­struc­ture, Quar­ries and the En­vi­ron­ment Kwe­si Des Vi­gnes says. The guns and ammunition seized by Tobago police during the operation. A worker from the Infrastructure Division operates machinery at Barbados Bay, Studlely Park. Rel­a­tives of hit and run ac­ci­dent vic­tim Leono­ra Patrick are call­ing on Po­lice Com­mis­sion­er Gary Grif­fith for jus­tice. All-To­ba­go Fish­er­folk As­so­ci­a­tion pres­i­dent Ju­nior Quashie has de­scribed the 2018/2019 fis­cal pack­age pre­sent­ed by Min­is­ter of Fi­nance Colm Im­bert on Mon­day as ridicu­lous. THA Chief Secretary Kelvin Charles, left, presents Kelvin Grant, of Kelrox Construction and Things, with a cheque for work his company did during the 2018 School Repair Programme at the Division of Education conference room last week. Con­trac­tors who worked on the School Re­pair Pro­gramme have been paid by the To­ba­go House of As­sem­bly. Five Ear­ly Child­hood Care and Ed­u­ca­tion teach­ers, with a com­bined ser­vice to To­ba­go of more than 80 years, have been fired from the Di­vi­sion of Ed­u­ca­tion, In­no­va­tion and En­er­gy, head­ed by Chief Sec­re­tary Kelvin Charles. Mark London on his way to victory in the NAAA TT One-Lap Savannah race at the Queen’s Park Savannah, Port-of-Spain, last Sunday. Lon­don, who re­cent­ly com­plet­ed an ath­let­ic schol­ar­ship at Cop­pin State Uni­ver­si­ty in Bal­ti­more, Mary­land, first won Di­vi­sion Three of the just con­clud­ed To­ba­go In­ter­na­tion­al Cy­cling Clas­sic (TICC). Members of the Run Things team pose before one of their matches in the Roxborough 10 for 10 Windball Cricket League recently. The in­au­gur­al Rox­bor­ough 10 for 10 Wind­ball Crick­et Tour­na­ment will come to close this week­end at the Cyd Gray Carpark, Rox­bor­ough. Guyana’s Andre Green is tailed by another rider along the Shirvan Road course during Tobago International Cycling Classic Day One action on Wednesday. Green, riding for Rigtech Sonics, eventually took the Division 2 title. Members of the T&T Cadet Force band during Remembrance Day celebrations in Scarborough. “Once a per­son has passed through Cadets you will know, that per­son will stand out from among the rest,” Sub Lieu­tenant of the Trinidad and To­ba­go Cadet Force Dave El­liot said as he proud­ly as­sist­ed in lead­ing the lat­est batch of re­cruits cel­e­brat­ing the or­gan­i­sa­tion’s 60th an­niver­sary in To­ba­go re­cent­ly. THA presiding officer Dr Denise Tsoi-a-Fatt Angus Fatt, right and relatives Dayle Angus, left and Ira Tsoi-a-Fatt showed their approval after trying the blue wine. Clarke checks some turtle sculptures done by the students. Revellers naturally gravitated towards the music truck during the Tobago fest J’ouvert celebrations at Canoe Bay. The To­ba­go Re­gion­al Health Au­thor­i­ty (TRHA) paid $1,835,806.06 to set­tle four law­suits brought against it be­tween Jan­u­ary 2013 and Ju­ly 31 this year. When Gram­my-nom­i­nat­ed rap­per Nipsey Hus­sle (Er­mias As­ghe­dom) was fa­tal­ly shot in Los An­ge­les two Sun­days ago, so­cial me­dia was flood­ed with users, in­clud­ing renowned mu­si­cians, ac­tors, and ath­letes ex­press­ing dis­tress over his death. Thou­sands of Chris­tians will be flock­ing to church­es this week­end for the an­nu­al Palm Sun­day ob­ser­vances. Ian Ramlochan fills water for his goats at Tenant Trace, Woodland, on Monday. Stray dogs lie on Independence Square, Port-of-Spain. At­tor­ney Gen­er­al Faris Al-Rawi will be served with a pre-ac­tion pro­to­col let­ter no lat­er than next Thurs­day, call­ing on the Gov­ern­ment to en­act a pol­i­cy to im­prove the wel­fare of an­i­mals or face court ac­tion. Opposition Leader Bharrat Jagdeo during one of his weekly press conference at his office in Guyana. De­spite gov­ern­ment claims to the con­trary, it has not been all “busi­ness as usu­al” in Guyana fol­low­ing the con­tentious De­cem­ber 21 no-con­fi­dence mo­tion. Books by three writ­ers from T&T have made the short­list for the 2019 OCM Bo­cas Prize for Caribbean Lit­er­a­ture, spon­sored by One Caribbean Me­dia. Students of the Art and Geography classes of the El Dorado West Secondary School stand proudly in front of the Freedom Wall. As the world ob­served Na­tion­al Slav­ery and Hu­man Traf­fick­ing Pre­ven­tion Month in Jan­u­ary, stu­dents of the El Do­ra­do West Sec­ondary School ac­cept­ed the chal­lenge to in­crease pub­lic aware­ness by cre­at­ing a Free­dom Wall. The stu­dents in­tend to ex­pand the project to cre­ate a Free­dom Cor­ner at the school. Flashback October 2018: Residents of La Horquetta South are rescued after they were marooned by flood. Children’s Authority oard of management, Chairman Hanif Benjamin, second from right, shakes hands with Fusin Adventage Founder and Race Director Charles Bobb-Semple as Children’s Authority Director & CEO Safiya Noel, left, and Children’s Authority Registry and Investigations, Manager, Rhondoe Gregoire-Roopchan during a press conference held at the Children’s Authority office Wrightson Road, Port-of-Spain, on Monday. 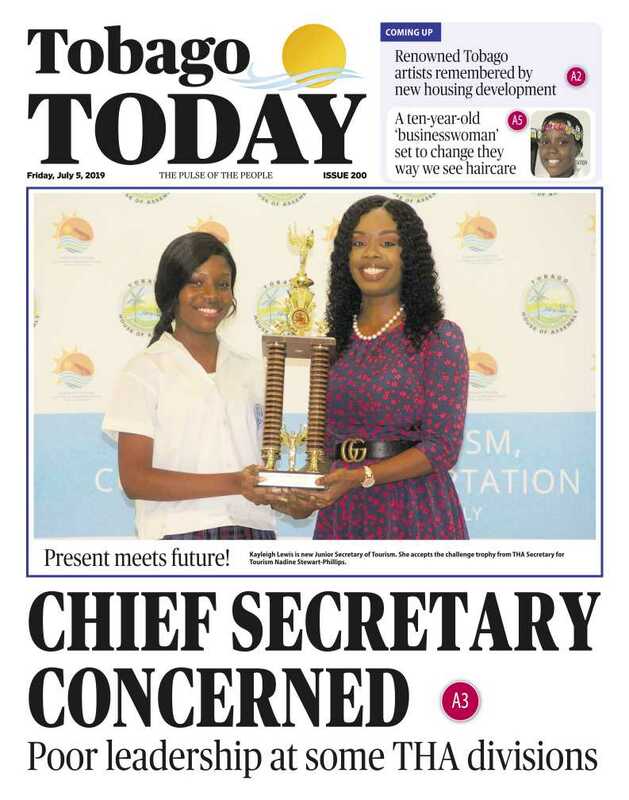 On the eve of the Sec­ondary En­trance As­sess­ment (SEA) ex­am­i­na­tion, the Chil­dren's Au­thor­i­ty of T&T plead­ed with par­ents to de­sist from in­flict­ing emo­tion­al abuse on pupils who are fac­ing in­tense pres­sure at this time, as this could ad­verse­ly af­fect them in their adult years. To­day marks World Autism Aware­ness Day and lo­cal lob­by­ists are us­ing the op­por­tu­ni­ty to re­new their call for a com­pre­hen­sive na­tion­al ac­tion plan for spe­cial needs chil­dren, in­clud­ing those suf­fer­ing from autism. From left, Corey Lane, Danielle Dieffenthaller, Sir Shridath Ramphal, Dame Sandra Mason, Prime Minister Mia Mottley, Kimala Bennett, A Norman Sabga and Professor Michael Taylor. The field of nom­i­nees for the An­tho­ny N Sab­ga Caribbean Awards for Ex­cel­lence can now in­clude peo­ple from coun­tries which do not have any nom­i­nat­ing com­mit­tee, ac­cord­ing to Sir Shri­dath Ram­phal, chair­man of the re­gion­al se­lec­tion pan­el.